Although the #fashion industry frequently gets a lot of hate from those who claim that it’s exclusionary and fake, it feels like many brands have taken strong strides to offer their customers a more authentic and inclusive experience. We’re loving the Photoshop-free images on ModCloth and Aerie’s websites, the Instagram model search that cast Marc by Marc Jacobs’ fall ’14 campaign, and the increase of transwomen as the editorial stars of fashion campaigns. Although, one of our favorite developments has been the idea that certain brands are actually listening to customer requests for models with bodies like their own. Some of these companies are turning customers into models — the latest being the plus size clothing brand Torrid. However, we’ve noticed a pattern with these innovative ways to show customer appreciation; the majority of brands that are featuring their customers are plus-size specific companies. We’ve previously written about blogger-backed campaigns that have both been featured in specialty stores as well as those that have spanned all sizes — including this summer’s more body-diverse swimsuit advertisement from Target — but the customer-as-model concept is a whole new approach to advertising to the masses. By eliminating the professional models and bloggers and instead putting a loyal customer in the spotlight, these brands are not only providing greater body diversity than what’s commonly found with the typical plus-size model, they’re also offering a type of shopping reward unlike any other gift with purchase. Although many might roll their eyes and assume that brands are opting to tap their customers as a way to save money on professional models and crews, Torrid didn’t just request a few snapshots and call it a day. 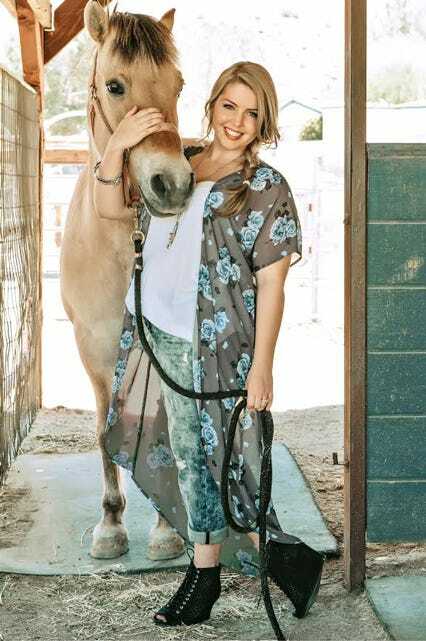 “It’s a different kind of shoot where we travel with our photography crew, plus wardrobe, hair and makeup, to shoot our girls in their hometown,” explained Torrid’s VP of Marketing, Lisa Stanley. The images of the women will be displayed in the windows and inside of Torrid stores, on the pages of Torrid’s catalog, and in multi-media advertisements that will be featured prominently on Torrid.com. There will also be special meet-and-greet events to celebrate each woman at her local Torrid store. Despite the positivity behind the increase in these types of campaigns, the question remains why are plus-size brands leading the pack in upping their inclusiveness to this new level? In the past, plus-size fashion has typically dragged behind straight-size offerings, so it’s interesting to see that the sartorial tables have turned. Whether it’s due to the vocal majority in the plus community that empathizes the desire for models who provide a more relatable standard of beauty — cellulite, stretch marks, etc. — or possible complacency from legacy brands that have never budged their sizes above a 14. It will be interesting to see what happens next. Will straight-size brands actually reflect on the immensely positive response to the customer/model campaigns and follow suit with similar concepts? Will more plus-specific brands join the body-diverse bandwagon and put the spotlight directly on their customers as well? Or is this another fashion fad twisted up as empowerment in a silk dress?